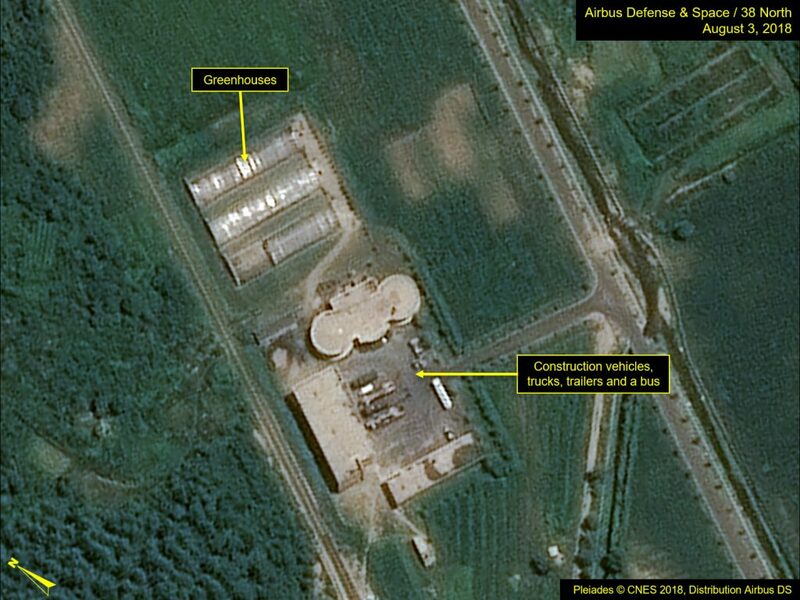 Commercial satellite imagery of the vertical engine test stand from August 3 indicates some minor additional dismantling of the steel base structure has occurred. The presence of steel components from the test stand are lined up on the concrete approach pad and approximately seven vehicles and trailers are present. Some of the latter have what appear to be cylindrical tanks—presumably from the dismantled fuel/oxidizer bunkers—on them. 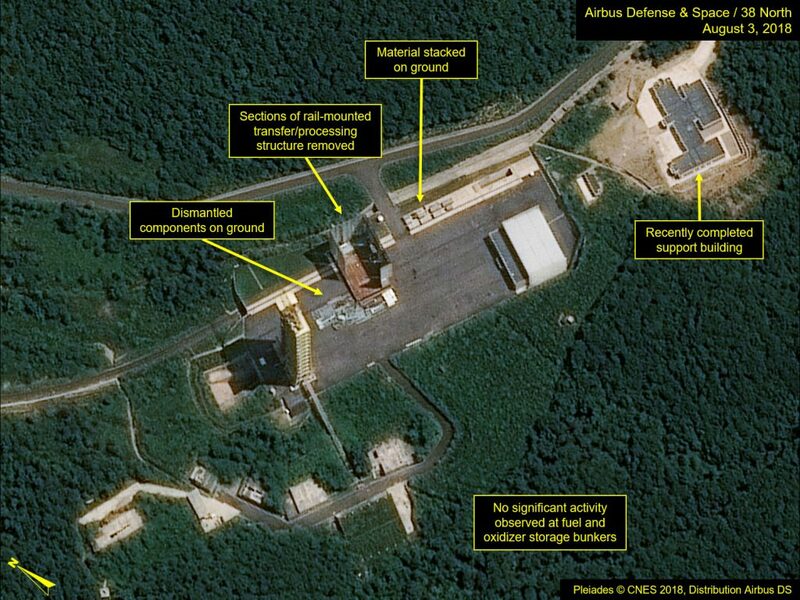 No additional dismantling of the fuel/oxidizer bunkers is apparent. Additionally, vegetation has started to fill in the previously barren blast area. Figure 1. 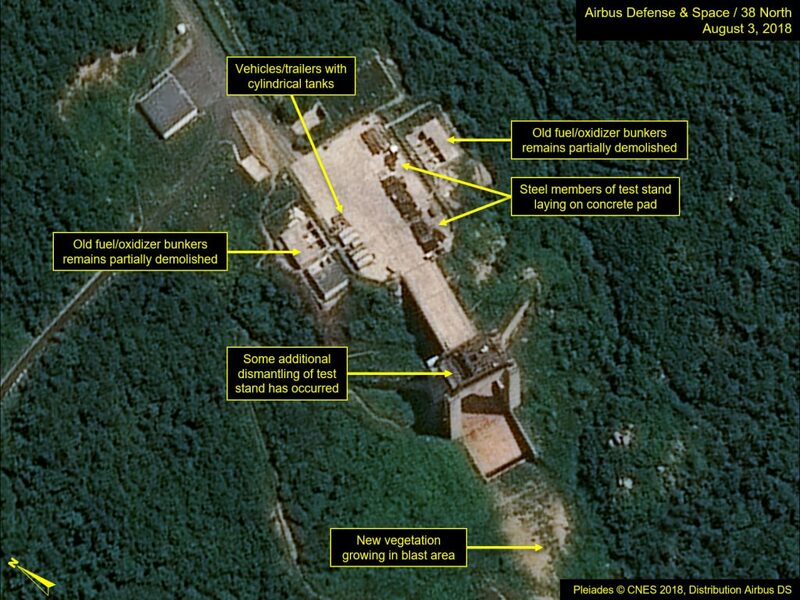 North Korea continues to dismantle the vertical engine test stand at Sohae. At the launch pad, minor additional work has been undertaken on the rail-mounted processing/transfer structure. Two-thirds of the west wall and a third of the north wall have been removed, as has a small panel in the south wall. A number of removed components remain on the ground adjacent to the structure and additional movement of vehicles and material is apparent. Materials are stacked near the underground rail transfer point and the construction crane previously seen here is no longer present. No significant activity is observed at the adjacent fuel/oxidizer bunkers, main processing building, gantry tower or underground rail transfer point. While the launch pad activity seems to be related to dismantlement, as it stands right now, we cannot rule out the possibility that it could be the beginning of a project to modify the structure for other purposes. Figure 2. Work continues on the rail-mounted processing/transfer structure at the launch pad. At the administrative and security headquarters facility, there are at least ten vehicles observed, including construction vehicles and trailers. Previously, on July 20 there were none and on July 22 there were five, suggesting an increasing level of overall activity at the facility. Figure 3. An increasing number of vehicles are observed at the administrative and security headquarters. The Tonghae Satellite Launching Ground on the east coast has been in caretaker status since at least 2013 and there are no indications of any renewed activity at the facility as of July 24, 2018.